Pines contain oleoresins, a sticky liquid mix of oil and resin (or rosin). “There are companies today that buy and dig old taproots for rosin production,” adds Anderson. 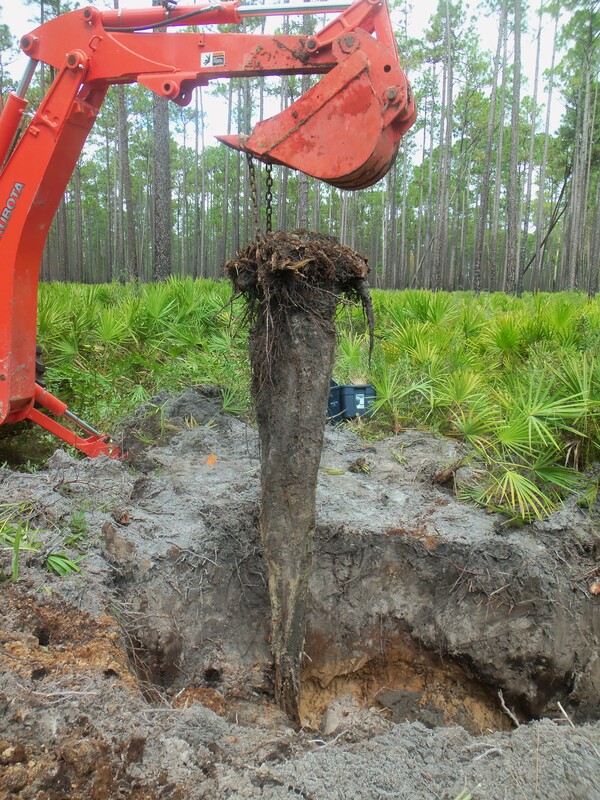 Longleaf taproot from a 75-year-old tree on the Austin Cary Forest in Florida, cut five years prior to excavation. Photo by Peter Anderson, USFS. Pines use their resinous sap to defend against insect pests – pitching out southern pine beetles, for example. This same substance also makes longleaf roots resistant to rot. Anderson led a recent study to quantify how quickly longleaf pine roots decompose after the trees were harvested – and how that impacts the duration of belowground carbon storage. This research was part of a larger project funded by the Department of Defense to quantify carbon stocks of longleaf pine forests on military bases across the southeastern U.S. The research team included research plant physiologists Kurt Johnsen and John Butnor. Their findings were published in Forest Ecology and Management. 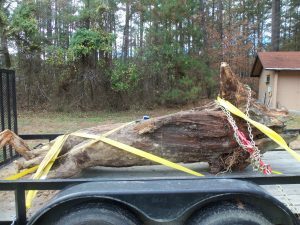 The scientists located forest stands harvested over the last 70 years selected stumps from locations across the native range of longleaf, from North Carolina to Louisiana. They dug out the stumps, removed the taproots and lateral roots, and collected soil samples. The oldest tree was cut in 1945 and estimated to have been 260 years old (with radiocarbon dating). In the lab, Karen Sarsony, Joel Burley, and Shelly Hooke dried, weighed, and ground the woody samples. Carbon and nitrogen concentrations were determined with chemical analysis. Soil samples were also analyzed for carbon and nitrogen, along with bulk density. The researchers used these data to develop a model for estimating the amount of carbon remaining in the coarse roots systems of longleaf pines. “We developed a simple model that predicts necromass loss based on stump diameter, years since the tree was cut, and air temperature,” says Anderson. The model estimates necromass loss, or decomposition, for coarse root systems, as well as taproots and lateral roots. Longleaf stump aged 260 years, dug from the Sandhills Gamelands in North Carolina. Photo by Peter Anderson, USFS. The model predicted that 54 percent of the longleaf pine root necromass would remain after ten years and 17 percent after 60 years. The scientists also compared necromass loss in longleaf and loblolly pine. “Longleaf roots persist a lot longer than loblolly,” notes Anderson. 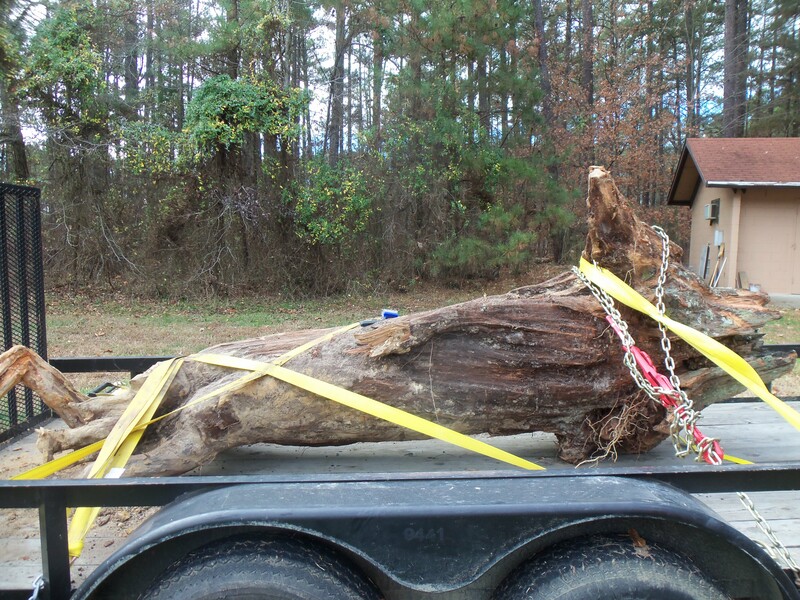 The loblolly decomposition data came from an earlier SRS study. Those results found that ten years of decomposition left about half of the root mass. After 60 years, less than five percent remained. The high root to shoot ratio of longleaf compared to other southern pines makes its longer root persistence even more significant for belowground carbon sequestration. The research team found lower bulk density, higher nitrogen availability, and greater carbon content in the soil samples collected close to longleaf stumps. This suggests that decomposing roots can also benefit carbon storage by creating favorable conditions for new tree growth. The longleaf carbon balance model is freely available through the University of Florida’s Carbon Resources Science Center, along with a user manual and video tutorial about its development and use. Across the South, longleaf pine forests are being restored as resilient ecosystems that are able to provide wildlife habitat, clean water, sustainable wood products, and, as it turns out, long-term belowground carbon storage. For more information, email Peter Anderson at panderson@fs.fed.us.